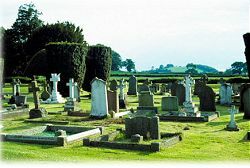 Hurley Monument Company: cemetery monuments, grave markers, tombstones, mausoleum, cremation urns and more. The “computer-generation” has changed the centuries-old craft of creating beautiful monuments. And we think for the better. Now, instead of the hit-and-miss production methods of the past, loved ones are enabled to participate meaningfully in the design approach. They, with the assistance of a member of our trained staff, sit at a computer and accurately create a design for the memorial, see the results, and confirm the content. We forward the design to our production department where artisans finish the monument accordingly. This greatly reduced the manufacturing, delivery and installation time. We use only the finest granite, deep etched, hand detailed and constantly monitored to assure your satisfaction. A wide choice of colors from quarries in Texas, the U. S., Canada, Europe, Asia and elsewhere are available. Our delivery and installation system is one of the best and fastest in the business. Delivery is never a problem. With our fleet of trucks, we can deliver and set your memorial anywhere in Texas. They were unique. And their monument should express just how you remember them. With our system of computer generated design elements, you play an active part in designing your choice of monuments. We have the ability to add custom artwork to your stone at no additional charge. If you want your brand, signature or other personal item as part of the design, we can help you to create a one of a kind memorial. Have exactly what you imagined, without the guess-work. Since 1919, we have been helping families in Texas with their funeral and monument needs. We pride ourselves on our history, and our tradition of first class service to every family we serve. We believe that each monument we make should tell a story of the person it represents. We hope you will allow us the honor of helping you create a lasting tribute for your loved one. Copyright © 2006 Hurley Monument Company. All rights reserved. Website Design by TMB Web Designs.